Is It Time for a New Electrical Service Panel? 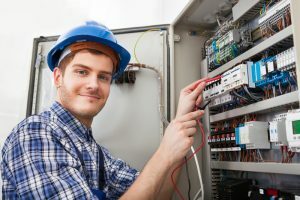 The panel of your Puyallup, WA electrical system, also known as the circuit breaker panel, is the hub of all your electrical wiring, appliances, and equipment. It is the location where incoming electricity is routed to the different circuits—each of which are designed to shut off in case of a voltage overload. If your electrical panel is more than a couple decades old, it’s time to make sure you aren’t overdue for an upgrade. Is your electrical panel 20 to 30 years old? Have you noticed signs of electrical wear like flickering lights or circuit breaker panels? Are you planning on adding any appliances to your home? It’s the holiday time, so are you going to be putting up outdoor lights? Even if your answer to any of these questions was only “maybe,” then yes, you need to consider an upgrade. Does Your Home Have a Fuse Box? It’s rare that today’s homes still have these outdated electrical components in place, but if your home was built prior to 1969 and has not been updated, then you may very well have a fuse box rather than an electrical panel with circuit breakers. This means that rather than tripping a breaker when there is excess voltage, one of these fuses burns out to stop the flow of electricity. Circuit breaker boxes are much more convenient. But more than that, they are safer. If your home is still using a fuse box, it’s absolutely time for an upgrade! Even if you don’t have a fuse box anymore in your home, you’ll still want to think about the age of your house. If it’s more than 20 years old and still has the same electrical panel or circuit breaker box, it’s almost definitely time to get a new one. Worn down electrical systems can become hazardous, but safety isn’t the only concern here. Electrical capacity is more what we have in mind. Electrical panels that were developed 20 to 30 years ago can handle 60 to 100 amps, while newer models can manage up to 200! It makes these upgraded panels much better suited to the rise in electrical demand in households from things like charging stations, computers, electronics, and even home security systems. How Often Are Circuit Breakers Tripping? We mentioned this a bit above. You shouldn’t have to make regular visits to your electrical panel during the week to reset tripped circuit breakers. If this is happening with only a single circuit, then it’s likely a problem with whatever appliance is hooked up to that particular circuit. If, however, different circuits are tripping, it’s probably that the panel itself is worn down or no longer able to meet the electrical demands of the house. Quite often, you’ll also notice flickering lights in areas of your home in addition to tripped circuit breakers, if your electrical system is struggling to meet demand. Whatever your electrical service needs may be, look no further than Sunset Air! Contact us today.